The air connection valve is activated with the air compressor engagement button on the armrest. Air can be used via the quick couplers. The air compressor engagement button can be activated when the machine is not moving, separator disengaged, and park brake activated. Once the air compressor is engaged by a button on the armrest, the system starts to fill the 60-L (16-gal.) air reservoir tank until a shut-off pressure of eight bars (116 psi) is reached. The system automatically stops to ensure power is only consumed if necessary. 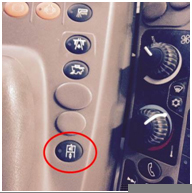 The remote adjustable tailboard can be adjusted from the cab conveniently via armrest control buttons (button A). 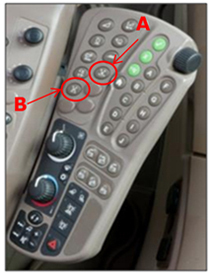 The in-cab adjustment includes a unique tailboard position swap button (button B) – by pressing the button on the armrest, the tailboard vanes automatically swap from left to right stored position and vice versa. The T670 with extra-fine-cut chopper comes standard equipped with wind paddles, which are factory installed on two knife rows. The wind paddles are mounted with bushings to withstand impacts from foreign objects. 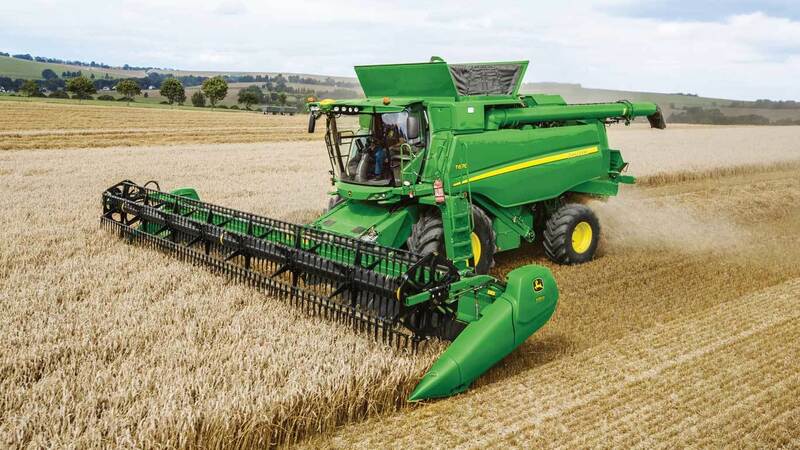 Equipped with wind paddles, the extra-fine-cut chopper is able to spread the chopped straw evenly up to 10.70 m (35 ft). 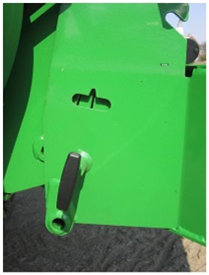 Wind paddles are more effective than active radial spreaders which are normally hydraulically driven. The extra-fine-cut chopper comes standard with a counterknife row, which is infinitely adjustable with two large leavers on each side. To secure the position, only one bolt needs to be tightened at each side. 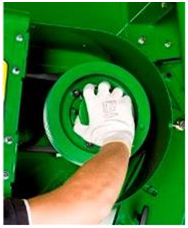 The remote cleaning shoe adjustment motors are equipped with an integrated position sensor. This eliminates the need of recalibration of the electric motors. Calibrations only need to be redone in case the electric hardware or the cleaning shoe elements get replaced. 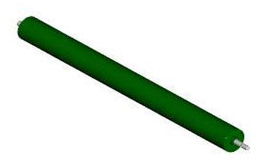 The quick-engage booster bar is adjustable from the outside via the stone trap with a 24-mm (0.95-in.) wrench. It has two positions. In the engaged position, the concave entrance features a profiled raps bar. 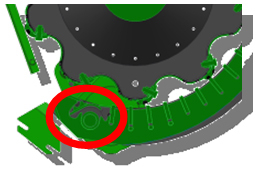 In the disengaged position, the concave entrance features a smooth transition plate. Adjustment can be completed easily within minutes. 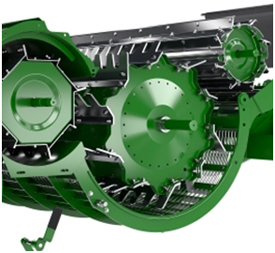 The T-Series threshing system uses a smooth surface stripper roller behind the threshing cylinder to gently direct the material to the overshoot beater. 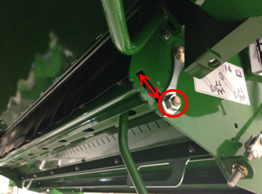 This prevents material from back feeding on the threshing cylinder, eliminating blockages of the cylinder. 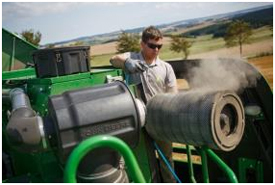 The stripper roller speed runs at 125 percent ratio of the threshing cylinder speed. The enlarged, 500-mm (19.7-in.) overshoot beater on the T-Series continues the material flow process. Material travels over the top of the beater and is directed into the separation drum. The eight-wing beater has a constant speed. The serration design of the wings’ leading edges engage the mat of material and move the high volumes of tough, damp straw without buildup or bunching. The 800-mm (31.5-in.) 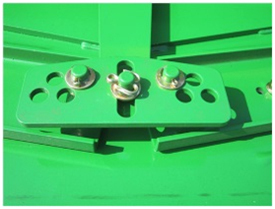 Xtra Large separator drum provides additional separation capacity of the T-Series. Due to the open design, the drum is not heavier in weight than the previous closed design. 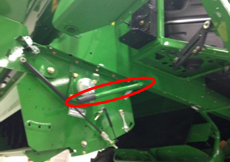 There is an optional 270 rpm speed reduction kit available for corn harvest which is included in the corn package. 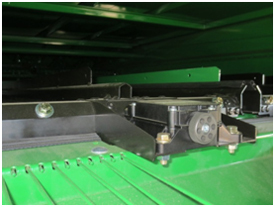 Swapping the belt speed can be done easily and quickly by changing the drive pulley via a lever-operated tension pulley. The Xtra Large separator drum runs at a lower speed compared to the previous design that was operated at 900/450 rpm. While it seems that higher drum speeds result in more efficient separation capacity caused by the higher centrifugal force, the opposite effect has been measured. While the centrifugal force has a vital impact on the separation capacity, speeds of the separator drum that are too high result in low exposure time in the high-performance separator grate. This is shown in the graph below. The T-Series has a seven-step straw walker concept. Compared to the previous T Series, the model year 2017 T-Series Straw Walker is extended by 80 mm (3.15 in. ), which results in a slightly increased overall straw walker area (+ 0.1m²). The concept of low walker rpm and high walker stroke provides efficient tossing to fluff even largest straw mats and open channels for the free grains to drop through. This results in most efficient grain separation capability. The straw walker is available with welded or bolted universal and CCM grids for best-in-class reconfiguration and ability to retrofit for all crops and conditions. The 400-mm (15.7-in.) 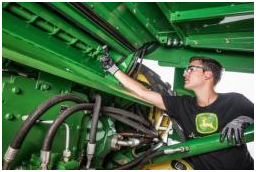 rear beater on the T-Series continues the material flow process. The beater delivers material to the straw walkers. The beater is driven directly from the Xtra Large separator drum and is operated at two speeds. 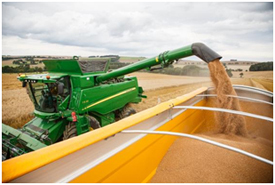 Inside the T-Series threshing and separation system is an eight-winged, rear beater drum that separates the remaining grains out of the straw mat thanks to the rear beater grate, which provides additional active separation area. 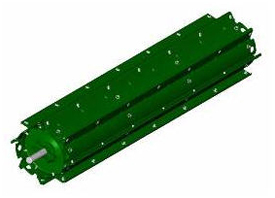 In combination with the new high performance separator grate, which features a dual design, the first three-quarters of the grate are equipped with wire-grate design, and the last quarter of the grate is equipped with a finger-rake design. 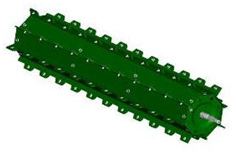 The dual design of the high-performance separator grate provides a boost in separation capacity and does not require manual adjustments that the previous finger rake grate did with the swing in/out function of the two finger rows in tough separating conditions. 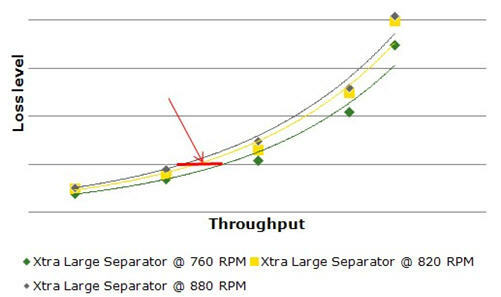 The graph below shows the separation performance of two T670s equipped with a 630R Platform running in the same field at same threshing settings. The machine with the high-performance grate clearly shows additional separation capacity compared to the machine with the 800-mm (31.5-in.) 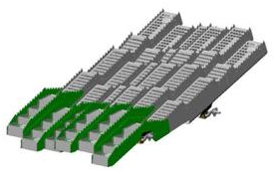 Xtra Large separator grate and an updated finger-rake design based separator grate.